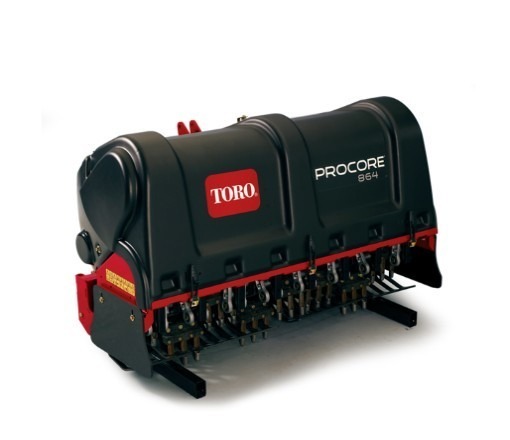 Toro’s ProCore® 864 is one of the newest additions to our highly innovative aeration product line. Proven coring head technology from the very successful ProCore® 648 combined with an improved platform, the result is the most productive and durable large area aerators available today. Kevlar reinforced belt drives provide smooth, quiet operation along with robust durability. This leads to increased operator comfort and a more enjoyable aeration experience. The depth control mechanism provides a quick and easy method for changing hole depth. The depth setting has a high gear ratio making changing depth a quick and effortless task. The RotaLink™ tine guide mechanism ensures tines remain vertical as they enter and exit the ground. This produces consistently clean holes for better looking turf and easier top dressing fill if required. The ProCore® tine placement is close to the roller, keeping them at a consistent depth as the operator travels over undulations. The compression springs combined with the independent coring head provide positive down pressure to ensure proper hole depth in the downward direction and provide a dampening affect in the upward direction when a large object is impacted during aeration. The efficient 64` (162 cm) and 98` (249 cm) aeration swath deliver maximum productivity for a broad range of forward hole spaces. The precision balancing weights eliminates hopping, rocking, and uncomfortable vibration for less operator fatigue and a more productive and efficient aeration experience. It allows the aerator to run in the up position and simplifies operation and increases efficiency in turn around. The oversized gear box provides improved capacity and durability for the toughest turf conditions. The ProCore® drive has precision balancing weights and each coring head is modeled after a 6-cylinder engine with precision balancing. This configuration eliminates hopping, rocking, and uncomforting vibration. This leads to less operator fatigue and a more productive and efficient aeration experience. Easy access to service components and minimal grease points result in less maintenance and less time performing maintenance tasks. This leads to higher machine and operator productivity and allows technicians to be more efficient. A linked mechanism that guides the tine actuation path and ensures they remain vertical as they enter and exit the ground. This produces consistent, clean holes for better looking turf and improved top dressing fill.